In the summer and autumn of 2009, while on tour throughout North America and Japan, Judas Priest celebrated the 30th anniversary of British Steel at each of their concert stops. Each night featured a complete performance of their breakthrough album – source of “Breaking The Law,” “Living After Midnight,” “Metal Gods,” “Grinder,” and more. Released in April 1980, British Steel became Priest’s first RIAA platinum Top 40 album in the U.S., their first Top 10 studio album in the UK. There is no overstating Judas Priest’s position at the very top of heavy metal’s Mount Olympus, and the critical importance of their deep album catalog on Columbia Records in the U.S., from 1977’s Sin After Sin to 1990’s Painkiller. In 2004, Halford reunited with Judas Priest and the band returned to Sony Music Entertainment. The appropriately leather-bound and metal-spiked five-disc retrospective boxed set Metalogy was followed in 2005 by Angel of Retribution (#13 on the Billboard 200 albums chart) and in 2008 by Nostradamus (#11). In 2009, A Touch of Evil: Live recapped Judas Priest’s world tours of the previous four years. One of its tracks, “Dissident Aggressor” earned Judas Priest their first Grammy Award this year, for Best Metal Performance. Indeed, Judas Priest is celebrated as progenitors of metal’s defining sound. The upgraded version of Behind The Music – Judas Priest (Re-Mastered) continues in circulation on VH1, and the band’s influence spreads far beyond the 30 million albums, singles and videos they have sold worldwide in their career. 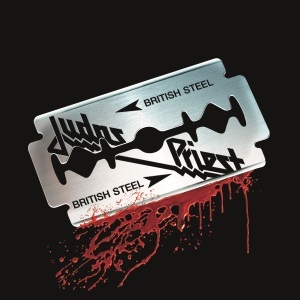 The long-term association (eight consecutive live and studio albums) between Judas Priest and producer Tom Allom includes this classic, their second LP together. It was recorded in four weeks at Tittenhurst Park, previously owned by John Lennon, and the home of Ringo Starr at the time. Radio airplay on AOR (album-oriented rock) stations for “Living After Midnight” and “Breaking the Law” (with its early promo video clip by Julien Temple) propelled the LP to #34 in Billboard and an 18-week stay on the chart. When British Steel was issued in 1980, a Columbia Records promotion involved a giveaway contest for a Harley-Davidson motorcycle (signed by the band members) that Rob had taken to riding onstage at shows each night. Three decades later, the 2009 tour resurrected the contest with another ‘autographed’ Harley. As planned, Judas Priest hit the stage running every night of their summer tour, crashing into “Rapid Fire,” the opening track of British Steel, and reclaiming the other eight songs on the record in grand style. Of course, the concerts did not end there. The band tore through another program-length of songs from the four corners of their history, starting with “The Ripper,” from their first Columbia LP, 1977’s Sin After Sin. “Prophecy” dated from their most recent studio album of 2008, Nostradamus; “Hell Patrol” was from the Columbia album of 1990, Painkiller; “Victim Of Changes” is one of the staples from their 1976 album Sad Wings of Destiny; “Freewheel Burning” was one of the stellar tracks (along with “Some Heads Are Gonna Roll”) that sent their 1984 album Defenders of the Faith to RIAA platinum; “Diamonds & Rust” is their jaw-dropping treatment of a Joan Baez song from Sin After Sin; and the show closed with “You’ve Got Another Thing Coming,” Judas Priest’s singular appearance on the Billboard Hot 100, from 1982’s Screaming for Vengeance. Tom Allom and Judas Priest were reunited again (having worked together not so long ago on the audio for the DVD ‘Rising In The East’) for the live recordings that comprised 2009’s A Touch of Evil. Allom is responsible for the stereo and 5.1 SurroundSound mixes of the live recording from the Seminole Hard Rock Arena concert that appears in these new editions of British Steel. The DVD will also include the bonus feature, “The Making Of British Steel,” a 30-minute interview featuring the four original band members. Disc One: CD - BRITISH STEEL (remastered in 2001) 1. Rapid Fire • 2. Metal Gods • 3. Breaking the Law • 4. Grinder • 5. United • 6. You Don’t Have To Be Old To Be Wise • 7. Living After Midnight • 8. The Rage • 9. Steeler • Bonus tracks: 10. Red, White & Blue • 11. Grinder (live). Disc Two: DVD - 30TH ANNIVERSARY DVD (Live at the Seminole Hard Rock Arena, Hollywood, Florida, August 17, 2009) 1. Rapid Fire • 2. Metal Gods • 3. Breaking the Law • 4. Grinder • 5. United • 6. You Don’t Have To Be Old To Be Wise • 7. Living After Midnight • 8. The Rage • 9. Steeler • 10. The Ripper • 11. Prophecy • 12. Hell Patrol • 13. Victim Of Changes • 14. Freewheel Burning • 15. Diamonds And Rust • 16. You’ve Got Another Thing Coming. Disc Two: CD - 30TH ANNIVERSARY - LIVE (Live at the Seminole Hard Rock Arena, Hollywood, Florida, August 17, 2009) 1. Rapid Fire • 2. Metal Gods • 3. Breaking the Law • 4. Grinder • 5. United • 6. You Don’t Have To Be Old To Be Wise • 7. Living After Midnight • 8. The Rage • 9. Steeler • 10. The Ripper • 11. Hell Patrol • 12. Victim Of Changes • 13. Freewheel Burning • 14. Diamonds And Rust • 15. You’ve Got Another Thing Coming. Disc Three: DVD - 30TH ANNIVERSARY DVD (Live at the Seminole Hard Rock Arena, Hollywood, Florida, August 17, 2009) 1. Rapid Fire • 2. Metal Gods • 3. Breaking the Law • 4. Grinder • 5. United • 6. You Don’t Have To Be Old To Be Wise • 7. Living After Midnight • 8. The Rage • 9. Steeler • 10. The Ripper • 11. Prophecy • 12. Hell Patrol • 13. Victim Of Changes • 14. Freewheel Burning • 15. Diamonds And Rust • 16. You’ve Got Another Thing Coming.